Mark the rail position on the posts, and remove the damaged railing. Position the new rail against the inside of the stairway posts. Align the rail with the top rear corner of the top post and with the mark on the lower post. Have a helper attach the rail temporarily with deck screws. 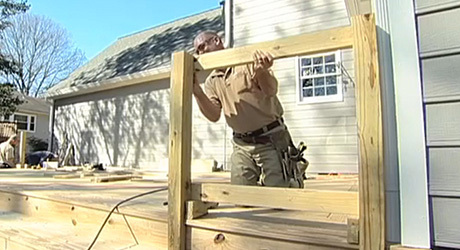 Join lumber for long rails by cutting the ends at 45-degree angles. Drill 1/16-inch pilot holes to prevent the nails from splitting the end grain, and attach the rails with 16d (3 1/2-inch) galvanized nails. Tip: Screws may split the mitered ends. 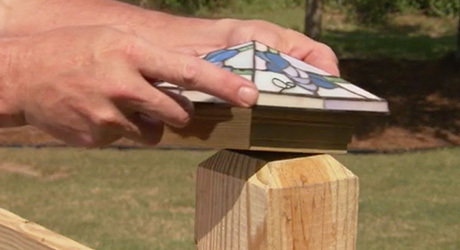 Attach the ends of the rails to stairway posts flush with the edges of the posts. 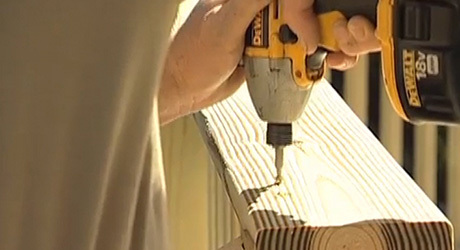 Drill 1/8-inch pilot holes, and attach the rails with 2-inch deck screws. Position the cap so the edge is flush with the inside edge of the rail. 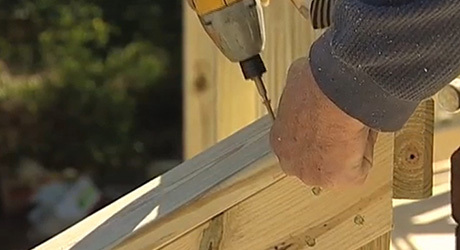 Drill 1/8-inch pilot holes, and attach the cap to the rail with 2 1/2-inch deck screws driven every 12 inches. Drive the screws into each post. Bevel the ends at 45-degree angles. Drill 1/8-inch pilot holes, and attach to the post using 16d galvanized nails. At corners, miter the ends of the railing cap at 45-degree angles. 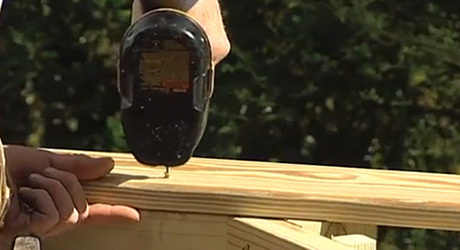 Drill 1/8-inch pilot holes and attach the cap to the post with 2 1/2-inch deck screws. At the top of stairs, cut the cap so that it is flush with the stairway rail. 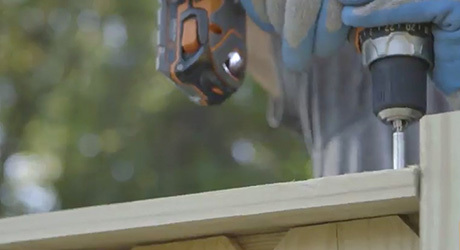 Drill 1/8-inch pilot holes, and attach the cap with 2 1/2-inch deck screws.